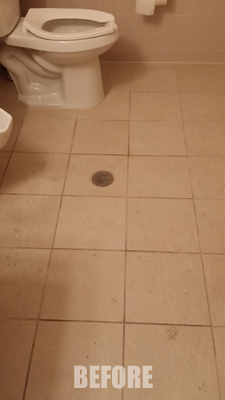 These before and after photos were taken during a commercial tiling cleaning job in Tampa FL. Tile flooring is a necessity in commercial bathroom settings. The only problem is that they can get away from you quickly. Bathrooms by design are a messy place. Even with regular cleaning they are difficult to maintain without professional help. Commercial tile and grout should be cleaned and sealed at least once a year to maintain a healthy and professional appearance. 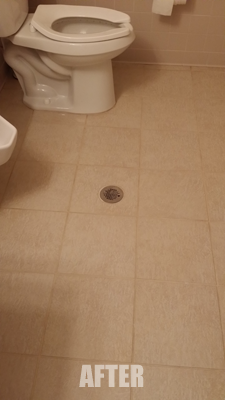 Chem-Dry of Tampa FL specializes in tile and grout cleaning and sealing. We can clean your commercial tile and make it look brand new again. For the best commercial tile cleaning call Chem-Dry of Tampa and schedule a free estimate.